When you mention painting to children their reaction is almost always one of pleasure. Just watch their smiles widen and their faces light up. 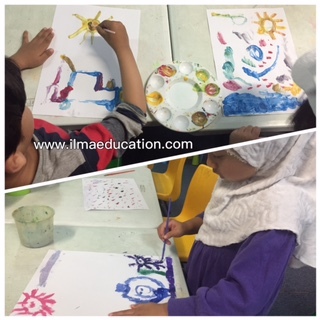 Children never seem to get bored with painting - maybe it's because they don't get to experience it often enough or because it allows them to freely express themselves or both. As a teacher or parent, painting is your secret weapon to liven up children's lessons. After teaching many children from the ages of two and up I've noticed a pattern that emerges in children's painting development. 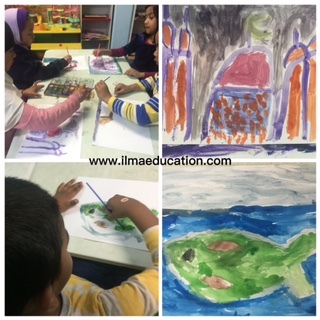 Below are the stages and how you can help your child develop his or her painting skills. In this stage, children will have had limited experience with painting. What you'll see them do is dipping the paint brush into the paint and spreading it onto the paint surface. They'll swirl it around a few times then dip the paintbrush again and paint it in the exact same spot as before. They will do this over and over again until the paper (if they're using paper to paint on) starts to rip because it becomes soggy with too much paint. Also as a result of this their painting becomes one blob of dull colour, usually in the middle. Some children will even paint the palette. They will be too busy concentrating on dipping the paintbrush into the paint and swirling it around on the palette and spreading it all over it. You will notice this in one of the photos above where the colours on the palette became one colour because of the mixing and spreading. 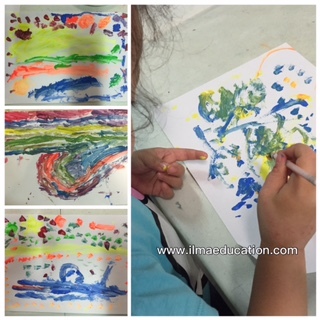 How to help your child in this stage: Give your child more experiences with painting. Paint every week if not every day. Once your child is over with the novelty of watching paint mixing and making marks wherever it is applied to, then encourage your child to fill up any of the white spaces with the paint instead of layering it on the same spot. Don't rush your child. Let him or her mix and swirl the paint in one spot to his/her heart's content. You can tell when they're ready for the next step when they become less excited with painting or they finish their painting really quickly. 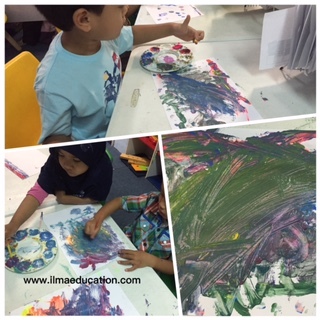 In this stage, children start to fill up their painting surface with paint instead of on the one spot. Wherever they see a white spot they will fill it with a different colour of paint. How to help your child in this stage: Once you've seen that your child has produced painting after painting of this style then s/he's ready to add some different brushstrokes to the painting. This was a child who was a bit bored with painting so I introduced him to the art of dabbing. After which he automatically included it into his paintings. In this stage, children are developing a repertoire of painting techniques, mainly the long brushstroke and the dabbing. They will combine the use of both into their paintings. How to help your child in this stage: When your child is ready and has had enough of dabbing and stroking paint. If your child hasn't drawn repressentational objects yet then you can encourage him/her to draw shapes such as circles, squares and triangles. This wll help with drawing represenatationally as most objects are made up of these shapes. 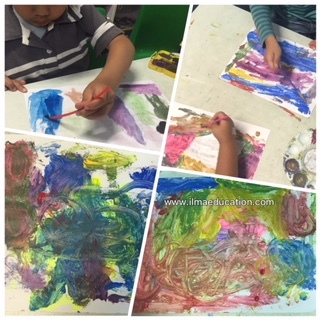 In this stage, children can represent people and objects in their painting. These things are easily recognisable. This stage develops quite naturally in children who can already draw representationally using pencil on paper. Once they can do this they will transfer this ability to their painting. You will notice in the above photo that children in the beginning of this fourth stage will usually only paint the outline of objects. They don't usually fill it in with colour. They also paint without a background. The background is usually left white. To help your child in this stage, encourage him/her to paint inside objects and fill the background and foreground with colour. At the later stage children will fill in the surrounding and background with colour. 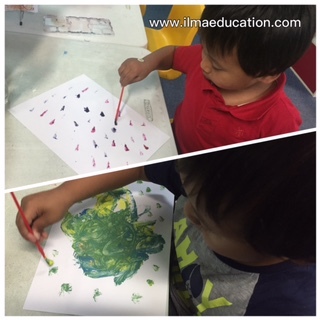 To develop your child's painting further, you could place objects in front of your child and ask him/her to paint it or take him/her out into the garden and paint something that s/he sees.